One good guy here on LJ once told me that I should mark or sign my projects. So I decided to make logo for my future projects. I designed it and one company which makes stamps made it of brass (3×4cm plate). With that logo, I wanted to give tribute to all 99 projects since 2010. as I joined LJ. 53 of 99 project got to Daily top 3 and I want to believe my projects realy worth it. Small acorn on left side of the board represents oak as traditional material in building houses, furniture and other household goods in the past, in major part of my country. Besides that, if you translate ACORN to croatian language you get ŽIR – first three letters of my surname ( ŽIRović ). nice logo ivan now you can mark all your projects as would any artist signing their painting!i have a electric branding iron with my name on it but for some reason I just rarely ever use it,maybe I need to start doing it more often too.congrats on 100 projects,looking forward to the next 100. Very creative logo and a good story with it too. Great going on that many top 3’s too. 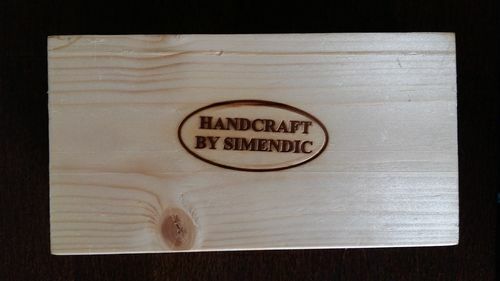 Ivan, you did a wonderful job on this branding iron. Ja sam nasao jednu lokalnu firmu kad sam bio u Srbiji i covek mi je odradio logo na cnc masini,mozda vise kosta ali je rezultat odlican. Takodje sam isprobao i varijantu preslikavanja kada je logo odstampan na papir ( moze da uspe samo ako je stampano na laserskom stampacu ),ali ta varijanta nije dugotrajna ako se proizvod namenski koristi,kao npr. moje kuhinjse daske. Wow nice name and burner buddy !!! Very nice. I like the story behind it as well. Keep on creating, Ivan! Congratulations on your 100th project Ivan, and thanks for the explanation of your logo. There is a lot going on there that I would have missed without your explanation. Great logo Ivan! Congratulations on your 100th project! Thanks for sharing your Successes; everyone was worth it!